About: Rock 'n' roll themed bar with American and Mexican food. "Rattlesnake jumps on to the Americana bar revolution bandwagon and gets dragged..."
London, it has happened, The Americana revolution has broken. 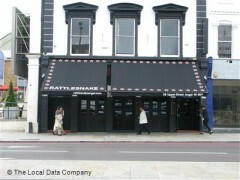 The sign being the appearance of bars like Rattlesnake in Angel. When rock and roll dive bars start taking over from Walkabouts (can we pine for Walkabouts?) it seems like a good time for something new. Residing on the corner of Upper Street opposite Angel Tube, Rattlesnake is pleasant enough. It’s next door to an O’Neil's, which is something in its favour but one look inside and the décor practically shouts about how inauthentic it is. Retro American signs, band posters and animal horns – this is a shamelessly engineered interior and on this occasion the bar also seems happy to be showing Family Guy on its big screens at 7pm. Weird indeed. The food is of that modern American flavour, which means burgers, wings and fries etc. In fairness, the burger we eat fills a hole, which means if you go hungry there’s always that at least. The fries are also good, er, just the right amount of salt. But this isn’t a food place, however much it might pretend to be. What the Rattlesnake is really about is much the same as the aforementioned Walkabout bar. It’s big, loud and in your face. The American tat (see Walkabout’s Australian tat), the back room stage for live bands and drink deals will attract you if you’re in the mood for a certain kind of night. A shot drinking, drunken dancing, ‘Mustang Sally’, kind of night. Rattlesnake might have got it wrong by jumping onto the Americana bandwagon but these venues need to exist. London has its unwritten hierarchy of bars and clubs and while Rattlesnake might not be at the top, it’s not quite at the bottom either.